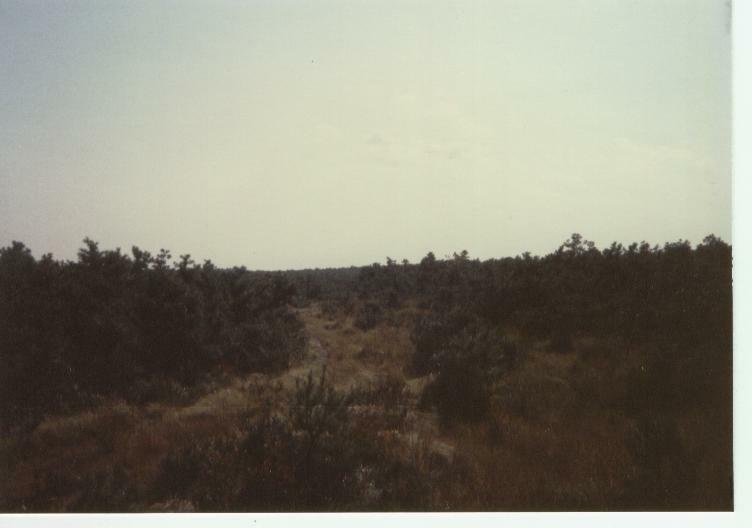 The vast Pine Barrens of NJ became our new area of operation and would remain so for many years to come. One thing was sure – there was a lot of wilderness out there. As we explored, both on foot and with our vehicles, we needed to keep our bearings and remember where we came from. I had grown up hearing stories about people getting hopelessly lost out in the Pines. Once you are out there, you understand. One sand road looks just like all the others. Those short pine trees and gnarly oak scrub don’t have any discerning features like a deciduous forest does. It was all too easy to take a wrong turn and be walking away from your truck or camp, instead of towards it. And all the time thinking that it will be around the next turn. It is easy to get deep into the woods out there. Dollar is one of the most gifted dead-reckoning people I have ever met, and many times led us back to camp after being out hunting all day. But we had a few tricks we used to keep us from becoming a statistic. When we came to a trail crossing or intersection, we would draw an arrow into the sand pointing in the direction we came from. This might seem like a no-brainer, but the locals could tell you more than a few stories about folks that neglected to do so and were lucky to come back out alive. Going out with a full tank of gas, or following your tracks backwards were helpful. Knowing what your tire tread and/or boot tread looks like helps along those lines. Keeping a good survival kit in your pocket is a must. Compass reading skills we learned in Boy Scouts were good for giving us general direction. It took a couple of long hikes, but we learned our way around in short order. A lot of the smaller roads and trails out there get started during forest fires, when the Rangers come in with special vehicles that are capable of plowing through even the densest of brush. Then, the locals come in and begin using the newly cleared areas to explore, hunt or ride dirt bikes. Most of them (most) cross other trials at some point, but there is little rhyme or reason to the layout. The County Line trail is an arrow straight scratch through the scrub. It runs exactly on the border between Burlington and Ocean counties. I have ridden my mountain bike for miles on this trail, encountering very few cross trails. This one trail alone can take you so deep out into the scrub that you could, inside of two hours, be miles from any standing water or paved road. And this was where we would retreat for anti-social activities. We moved our camp to a clearing off the side of the road. There was an old rut running through the clearing that became our fire pit. Off to one side was an area of slightly higher ground thick with grass. We put our tent there. It was a good campsite. The clearing allowed us plenty of room to setup and move around. We even had a shooting range, where countless pumpkins, rutabagas, apples and stale loaves of bread were blasted to tiny pieces. One thing about the crew camping out – no matter what camp might look like on Sunday morning, it was spotless when we left. SPOTLESS. 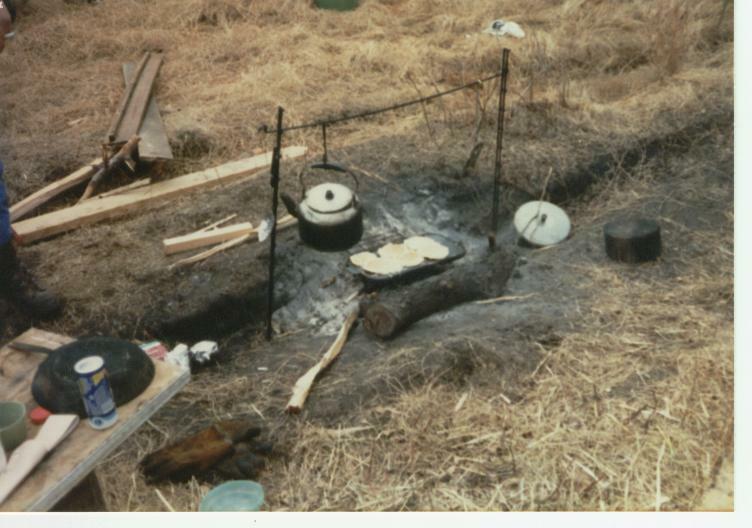 We were strict about not leaving anything behind except firewood, and there usually wasn’t much of that left either. We cooked over a fire. We didn’t bring propane or Sterno. That stuff cost money, added weight and who needed it anyway? Boy Scouts had taught us that we could survive just fine with a wood fire. It cooked our food, provided heat and light and was a good focal point for the evening. “Better than TV.” Dollar declared once. These pictures – we were set up real good. We had brought 3 bales of straw out with us. One bale was broken up and went under the tent. It provided a warm, dry and well padded underlay for the tent. The other two bales were stacked up beneath a wind break that we built out of 2×4’s and a plastic sheet. At night, with the fire going full blast, the windbreak trapped and reflected heat back. It was very comfortable. You can see that Dollar is well content, as the Studogger gazes off at something of interest. That chopping block in the foreground is the stump of a double-trunk tree we dragged out. It functioned perfectly; split wood on one side, bury ax in the other. In back of that is our ‘ground table’. A length of 2×10 nailed to two shorter pieces to keep it above the dirt and stable. To the left of that is our fire pit. The contraption that the coffee pot is hanging from is a device I made (I worked in a wire fabrication shop at the time). It was two uprights that get stuck into the ground, and a cross-piece that hooks across the top. Metal hooks suspend the coffee pot, 8 qt. pot and a smaller tea pot above the flames. Under the coffee pot is our cast iron griddle – with a six-pack of pancakes getting ready to be eaten. If you look closely, between Dollar and Studogg is another table. Another brainstorm of the ever-scheming Dollar, it is a board nailed to a log. It functioned admirably, as you can see. 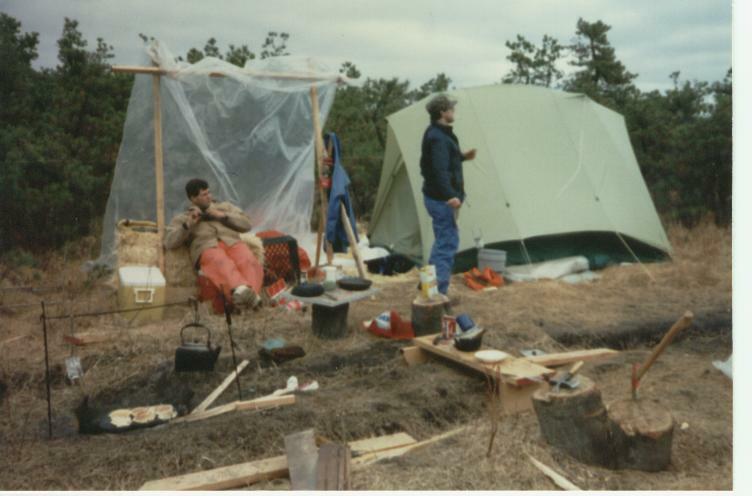 We spent several camping/hunting trips at that site. It served us well, up until one Sunday morning when the local dirt bike militia came roaring through camp and almost took out the fire pit. We watched in hung-over, quasi-interest as Yamaha 250’s and KZ 125’s rolled, dodged, bounced and crashed all around us. Not a word was spoken on anyone’s part. The crew, well, we were a little beaten up from the previous night’s activities. The dirtbikers were clad from head to toe in all manner of personal brush guards, so they couldn’t get an audible word out. There were no obscene gestures on anyone’s part, either. I like to think that it was a case of mutual respect – you find that out there (sometimes). Both parties being of equal fortitude to survive the unforgiving scrub, you naturally have respect for each other. But the fact might have been that there were so many dirtbikers, maybe a dozen of the knobby wheeled mutha’s. As far as the Birdcrew was concerned, well, we had shotguns. And .22 rifles. And plenty of ammo. We generally didn’t fear intrusions. All kidding aside, if any of those bikers had decided to stick around instead of roaring off into the scrub, they would have been invited to a hot mug of coffee and a plate of pancakes topped with cherry pie filling (as evidenced by Dollar, here. 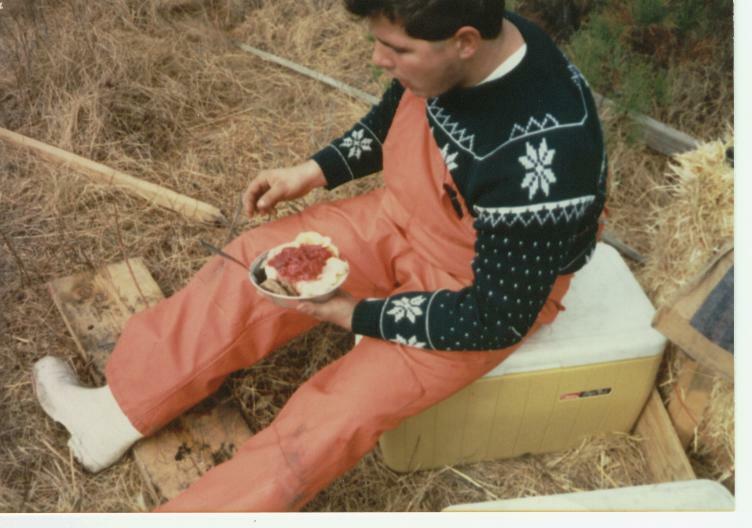 The rubber overalls and boots? That is called ‘learned conditioning’ from the Thanks-giv-o-fest washout). But dirtbikers and their trails, wheel ruts and impromptu morning visitations were not to our liking. Change was in the air.